https://d2wldr9tsuuj1b.cloudfront.net/6746/slideshows/homeLarge/Holy-trinity-poughkeepsie-2.jpg Welcome to our Parish! Thank you for visiting our website! This year&apos;s parish festival will be held on: Thursday, May 30th, 6:00 - 9:00 pm, Friday, May 31st, 6:00 - 10:00 pm, Saturday, June 1st, 2:00 - 10:00 pm and Sunday, June 2nd, 1:30 - 7:00 pm. There will be carnival rides, music, Sheriff K-9 demonstrations, and of course, FOOD! Are you interested in volunteering for this family fun-filled event? We&apos;d love to have you! Please join us at our next planning meeting on Monday, April 29th at 7 pm in Bishop Mestice Hall or call Mike at 845-454-0354. Please click on the picture for complete information on Youth Day! Young adults from our parish and community are welcome to join us for Mass on the last Wednesday of every month at 7:00 pm. Our next Mass is scheduled for April 24th. After Mass, join us for fellowship at a local eatery. The Sanctuary Lamp and Bread & Wine are available for memorializing. This is a special way to remember a deceased family member or loved one or to celebrate a special event. The remembrance begins on Sunday and ends on Saturday of that week. The offerings are $20 each. Please visit the Parish Office to make your request. Please remember that our memorial bricks which lay the path to Our Lady&apos;s Grotto are also available. Eligibility forms to be a godparent or sponsor can ONLY be given to those who are fully initiated in the Church, meaning they have been Baptized AND received both Confirmation and First Holy Communion. In addition, they must be active and participating members of Holy Trinity who have been registered for 6 months or more. FORMED is a revolutionary online platform featuring the best Catholic videos, audio talks, eBooks and movies from trusted partners like the Augustine Institute, St. Paul Center, Marian Fathers, Lighthouse Catholic Media, Ignatius Press and Word on Fire. Catechism and Personal Faith Formation are at the fingertips of every parishioner.Visit "holytrinitypoughkeepsie.formed.org" for unlimited FREE access today! This year, consider giving the gift of a Catholic education! Catholic Schools in the Archdiocese of New York are Christ-centered, academically excellent, and welcoming communities that teach students to be life- long learners and leaders energized by fidelity to Christ, the Church, and one another. To learn more about our faith-based Pre-K, Kindergarten or elementary schools, visit www.CatholicSchoolsNY.org or call 646-794-2885 to speak with a representative. 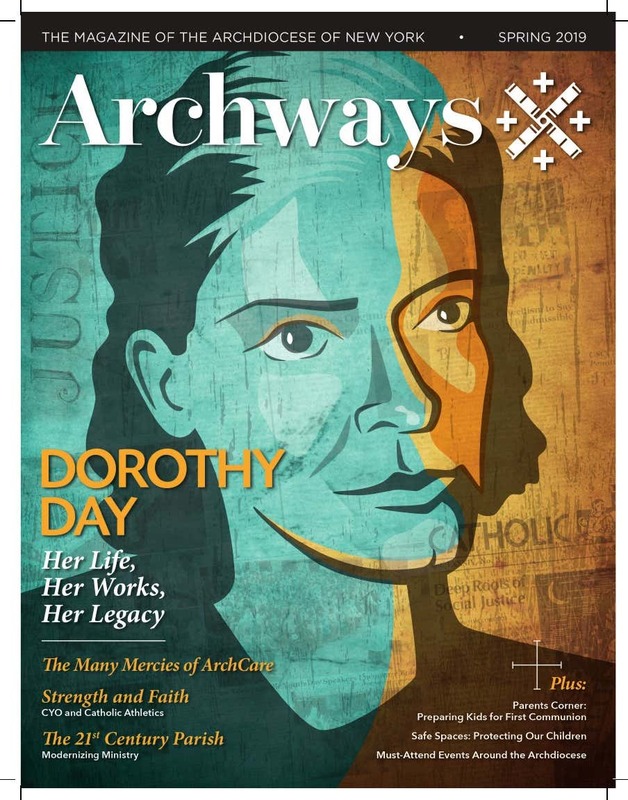 Archways is a new publication of the Archdiocese of New York, created to give our 2.6 million Catholics news and information about events, programming, and volunteer and charitable opportunities available to them. Archways will publish quarterly: twice per year in print and online, and twice online only. Click on the picture to download a PDF of the magazine for free! Modern talk for today&apos;s Catholic. Cardinal Timothy Dolan, Lino Rulli, Fr. Dave Dwyer & more. Saints and sinners welcome! 1st Fri: 10:00 AM to 5:00 PM 3:00 PM Chaplet of Divine Mercy 5:00 PM to 6:00 PM Rosary, Evening Prayer, Benediction: Supper gathering in BMH afterwards.